“I would like to draw your attention to following video produced by World Rainforest Movement – an international network involved in efforts to defend the world’s rainforest and forests peoples. impacts that monoculture plantations have on women. World Rainforest Movement has recently produced a 12 minute video called “Women raise their voices against tree plantations. 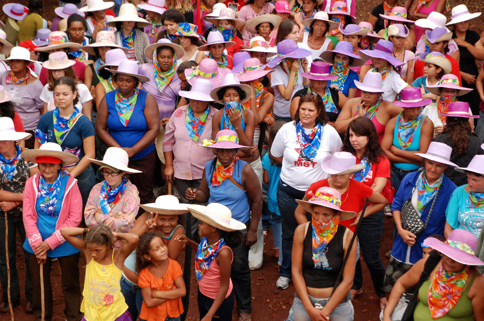 Testimonies from Brazil, Nigeria and Papua New Guinea” (available at http://www.wrm.org.uy/Videos/Women_Voices.html) which was announced on March 8: International Women’s Day. In the case of Papua New Guinea the workshop refers to oil palm plantations that are being mainly promoted to feed the European market with palm oil (used in products such as cosmetics, soap, vegetable oil and foodstuffs) as well as for the production of agrofuels. The second case is that of Nigeria which is about rubber plantations established on the lands of a local community by the France-based Michelin company for producing rubber used in the manufacture of tyres. And finally the Brazilian case is about eucalyptus plantations set up by three companies -the Swedish-Finnish Stora Enso, Aracruz Celulose and Votorantim- for producing pulp for export to Europe for converting it there into paper. World Rainforest Movement hopes with this tool to raise awareness on how European policies, consumption levels and corporations are impacting on women’s lives in Southern countries. Footnote. It can be added that Friends of the Earth International also have co-produced the video together with WRM.